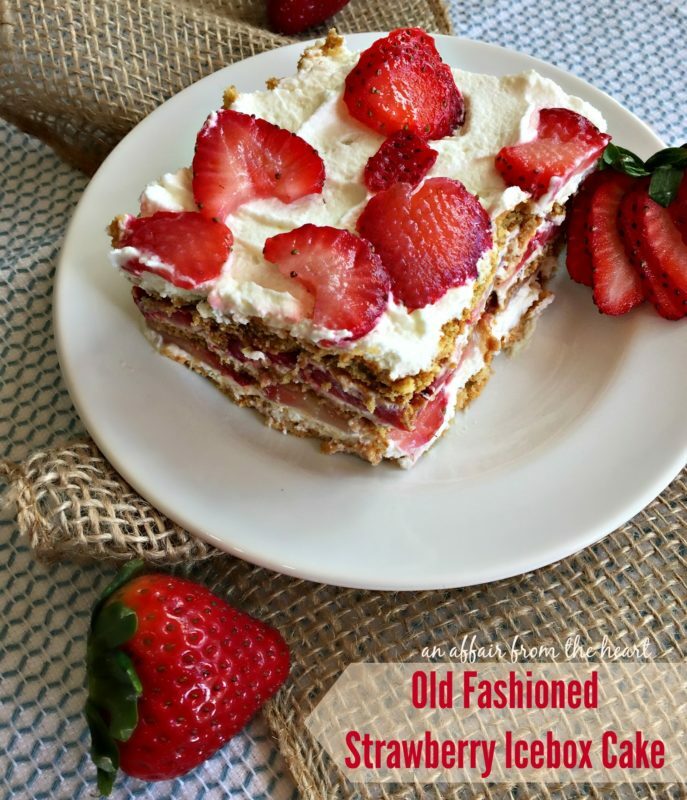 Old Fashioned Strawberry Icebox Cake - No Bake Dessert Perfection! 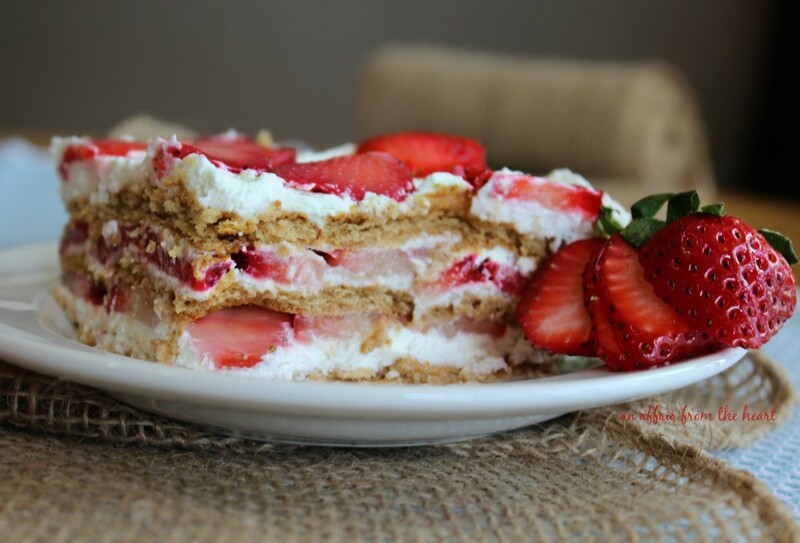 Layers of whipped cream, fresh strawberries and graham crackers. 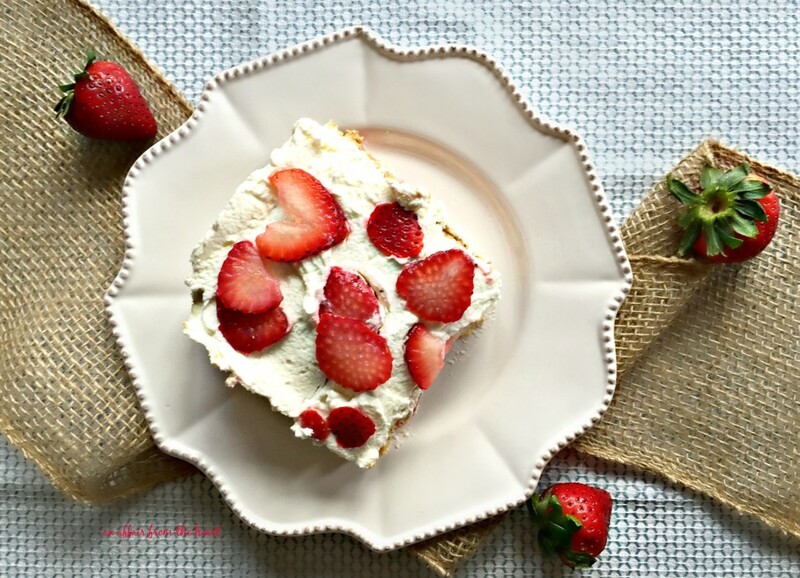 This no bake Old Fashioned Strawberry Icebox Cake is summertime dessert perfection! Creamy layers of whipped cream, fresh strawberries and graham crackers will have your taste buds going crazy! This no bake summertime dessert may be old fashioned — but it’s completely fabulous! Lately, I have been loving all of the vintage recipes I have been seeing. Some things stand the test of time and truly are not able to be made “better,” am I right? Summertime calls for recipes that are made with ease, won’t heat up your kitchen, and are full of those summertime strawberries that are red and ripe and bursting with flavor. I just can’t get enough! This dessert has all of that! In fact, I think it would be perfect for the upcoming holiday weekend, don’t you? While we are on the subject of “old fashioned” can we talk about my fridge? Cleaning fingerprints off of stuff around here was like a full-time job. So, I let go of the idea and went with white appliances. I recently had to replace my microwave, and installed a stainless one. It drives me bonkers they it doesn’t match all of the other appliances, but I decided to grin and bear it and replace them all as they needed to be. About 6 months ago, I almost bought a new fridge, and my husband talked me out of it. He said replacing it based on color alone was silly. So I decided to wait it out. Then…. You guys. I still can’t believe it. 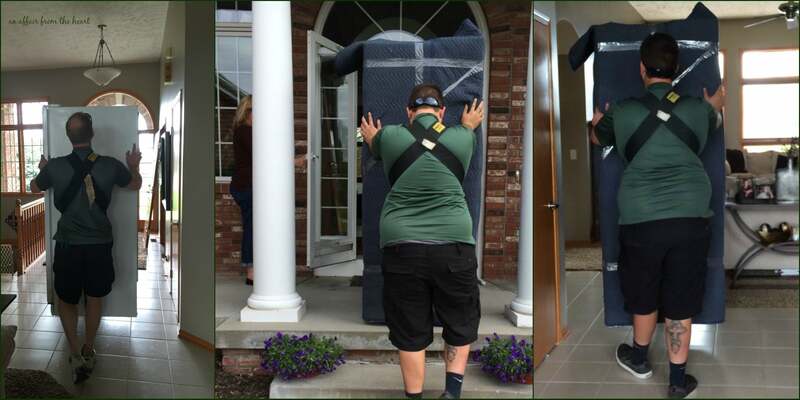 Nebraska Furniture Mart asked ME if they could GIVE me the new Samsung Family Hub Refrigerator! They just wanted me to use it, and tell you about it! Seriously? This, my friends, is what you call a no-brainer. 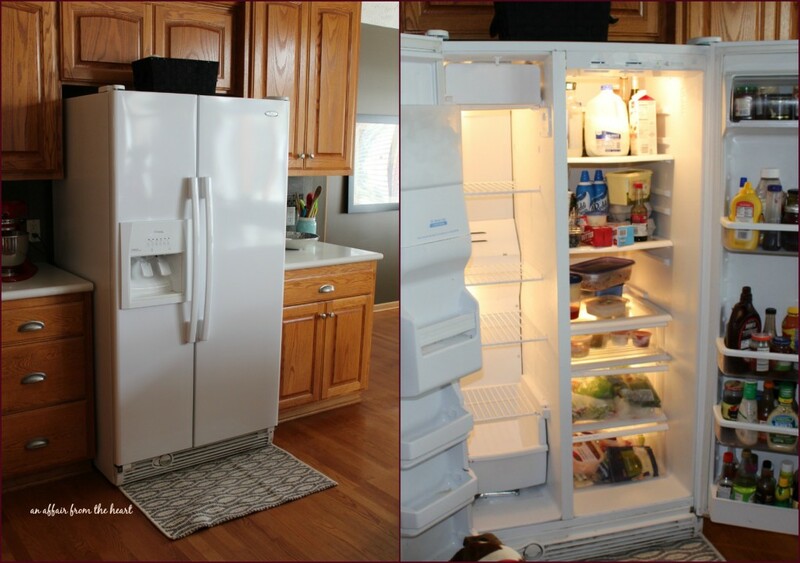 This refrigerator is BRILLIANT. 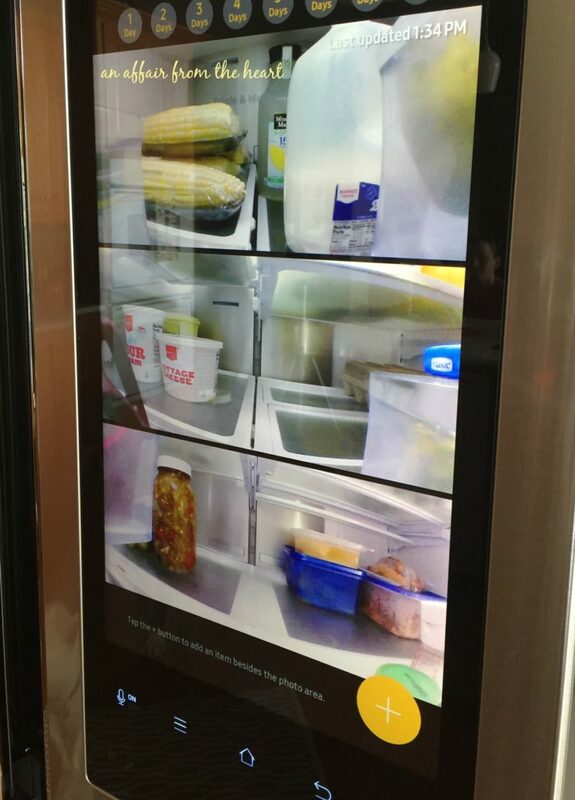 It’s like everything you could ever imagine wanting in a fridge, with the knowledge of a tablet right on the front. Right from the start, I am excited about the features that will make my shopping so much easier. Can you believe there are cameras inside the fridge? What?? Cameras IN the FRIDGE?? YES! 3 built-in digital cameras that link directly to your smartphone to see inside your Family Hub anytime, anywhere. If it only had this feature, it would be the fridge for me. I am notorious for compiling my list then going to the store without it. Out of milk? I don’t know? Let’s look inside the fridge! Nope — still have milk! The other thing that will be a lifesaver for me? The shopping list. Compile the list on your fridge, it’s accessible from your phone! #winning You can even purchase groceries right from your refrigerator touchscreen using Mastercard Groceries. 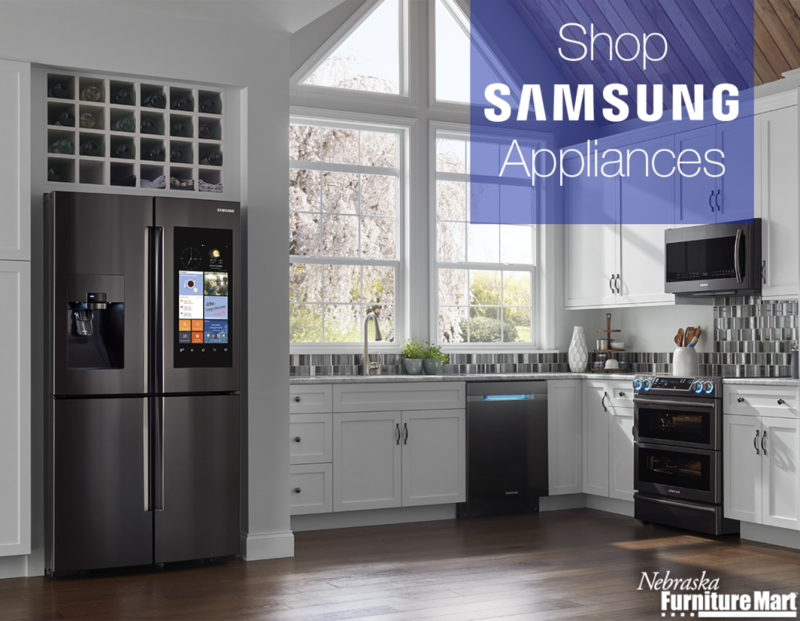 With this Samsung Family Hub Refrigerator, your kitchen is truly the the center of your home. Family Hub helps you manage your home and your life, with Food Management, Family Connection and Entertainment capabilities, all controlled from a 21.5” Wi-Fi enabled touchscreen on a beautiful 4-Door Flex Refrigerator. We are able to share multiple calendars, photos and notes and even stream music, right from the fridge, using apps like Pandora and Tune In radio. I cannot wait to get more acquainted with this awesome new appliance! We have only had it for 3 days and we are already in love! I’ll be sure to come back and tell you all about everything it does, once we get used to all of the many many features. I have to share with you a couple of photos from the install. Nebraska Furniture Mart, was punctual, as always. They had to remove the hinge from my front storm door to get the old fridge out, and the new fridge in. Then I was shocked to see them carry them right on their backs!?! NFM will take your old appliance with them when they leave, but in our case, I had them move it to our out building. The new refrigerator came in all wrapped up in a blanket, they took lots of care with it, as well as my wood flooring in my kitchen. They set up the fridge, and made sure everything was working properly. We have been lifetime shoppers at Nebraska Furniture Mart, I cannot imagine having service that was any better than we received. What do you say we get back to the dessert? I thought what better way to say “Buh-Bye” to that OLD fridge than to make a yummy icebox cake perfect for summer! My Grandma always called her refrigerator “the icebox.” It’s a word I will forever link to my sweet little Grandma. This recipe is from an old church cookbook she gave me a long long time ago. This icebox cake is so simple to make. It’s like making a lasagna, but for dessert! I love this set my mom gave me years back. When the strawberries are in season, this Strawberry Slicer and Huller Set really gets a work out! Whipped cream, sliced strawberries and graham crackers are all you need. Cover the bottom with whipped cream, break apart graham crackers to cover the bottom of the pan, cover with whipped cream and strawberries and repeat. Cover and chill in your “icebox” until set. I love how that one strawberry turned out heart-shaped. It suits my mood perfectly. Not only am I in love with this dessert — I am head over heels for my new refrigerator! Thanks, NFM! The graham crackers become soft and cake-like, and the flavors are tremendous! Want to really make this patriotic for the weekend? Add some blueberries, too! Let’s (no) bake up some summertime deliciousness! Combine whipping cream, vanilla and powdered sugar with an electric mixer until stiff peaks form. Divide cream into 3 equal portions. Divide strawberries into 3 equal portions. With a rubber spatula, smear a small portion of whipped cream to the bottom of a 9x13 baking dish to hold the first layer of graham crackers to the bottom. Line the bottom with graham crackers, breaking into pieces so that the bottom is completely covered. Top with 1/3 of whipped cream, top with strawberries. Repeat with another layer of graham crackers, whipped cream and strawberries. Top with a final layer of graham crackers, whipped cream and strawberries. Cover with plastic wrap. Place in the refrigerator for a minimum of 2-3 hours. Better overnight. Add blueberries to make this into a perfectly patriotic dessert! We are lifetime shoppers at NFM! The Samsung Family Hub Refrigerator was provided by Nebraska Furniture Mart, all opinions in this post are my very own. I must make this! Looks amazing!!! I adore vintage recipes! 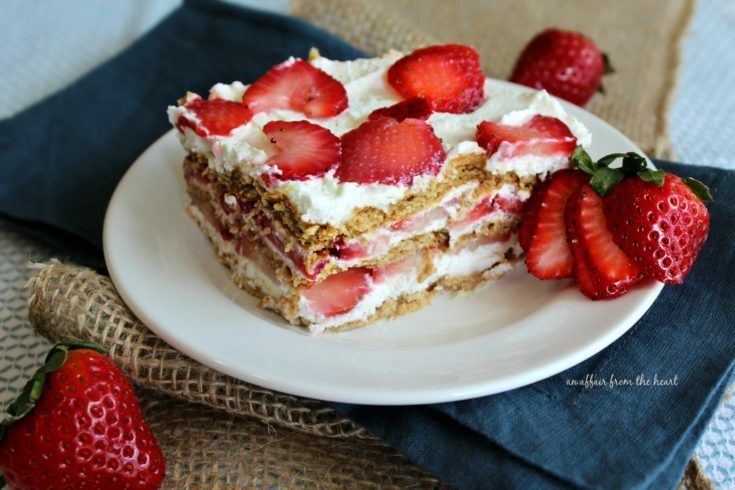 Your Strawberry Icebox Cake looks wonderful, Michaela! 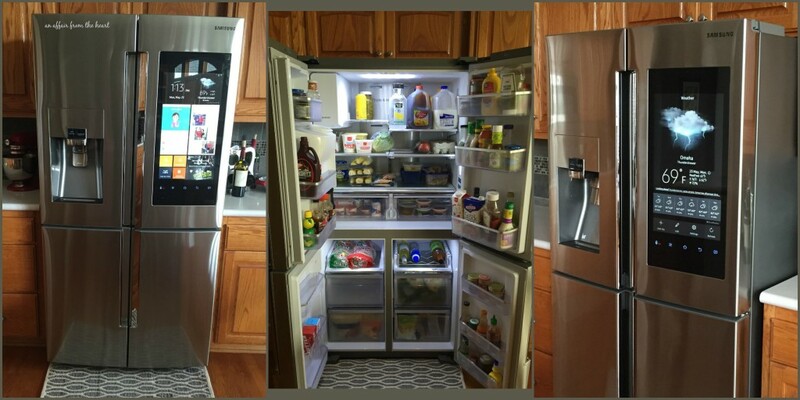 Love your new fridge as well – it’s gorgeous! I saw the commercial for this the other day. I thought…must have this in the future. Amazing. Oh, and your strawberry dessert recipe. Sounds incredible. I saw a commercial for this fridge — I think it had Dax Shepherd and Kristin Bell in it. So funny, and after that and reading your experience, I want this fridge! 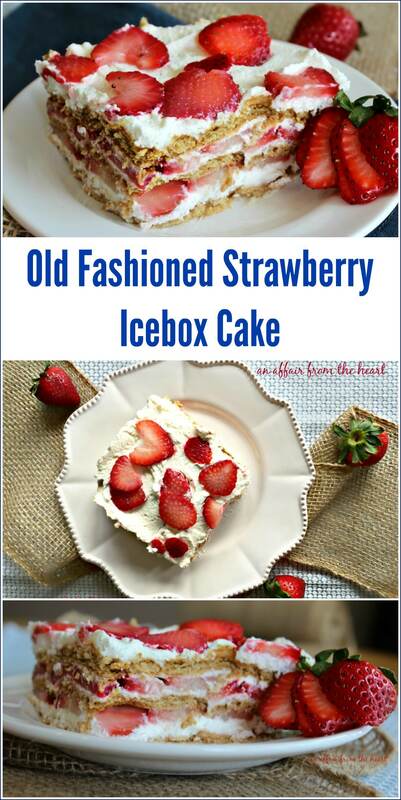 I love vintage recipes and your icebox cake looks loaded with deliciousness! And, yes, I want a fridge like that, too! That’s awesome!!! That cake looks so yummy! And that refrigerator looks AMAZING! I love this no bake dessert. 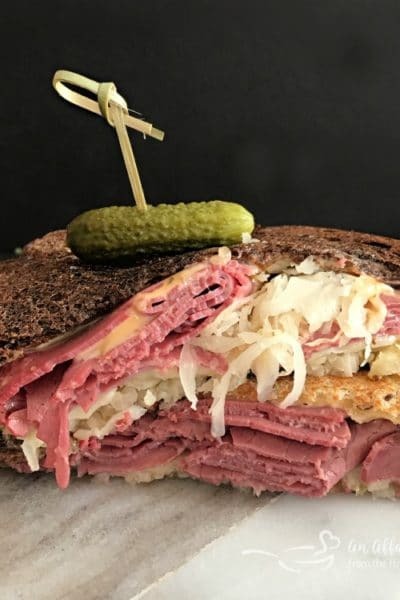 It looks amazing and only 5 ingredients? Count me IN! A pretty summertime treat! 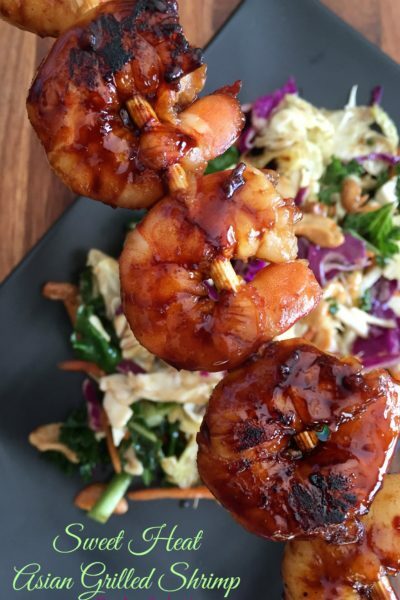 I love that it’s easy and looks so delicious! Strawberry season is here! Ours are just coming ripe. Great Timing! 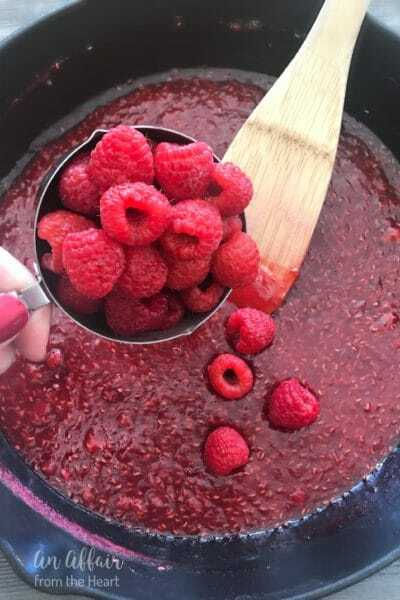 Great post, love your new fridge and of course the Old Fashioned Strawberry Ice Box Cake is the Best Summer Dessert ever! I do love no bake desserts, and nothing is better than strawberries and cream. My family would gobble this up! 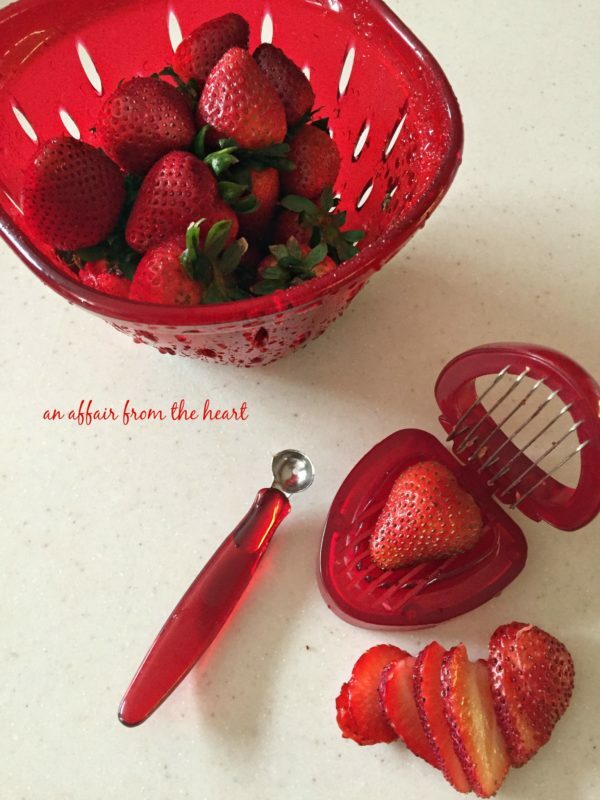 I love that little strawberry slicer you have too, it is so adorable. Thanks! I use it all of the time! Congrats on your new fridge Michaela! It’s awesome! And I adore your strawberry cake…what a perfect dessert for Memorial Day! Thank you , my friend! 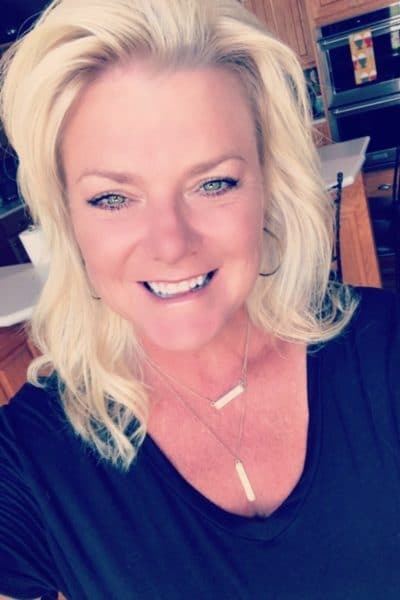 So happy for you! It’s just beautiful, just like that strawberry icebox cake! Yum! The icebox cake looks great, but what I’m really drooling over is your “finger print resistant” fridge….not that’s just dreamy!!! I just saw the commercial, fantastic fridge, i have been wanting to make this dessert. I want a new refrigerator now! That’s awesome! Seriously need to get some strawberries now, and make this dessert. Yum! Thanks, Kris!! I know you will love it! Both the fridge and the recipe look amazing! The fridge is amazing!!! The icebox cake looks pretty tasty as well! Thanks, my sweet, awesome sister!! SO looking forward to meeting your new Fur-Baby…and to consuming ANYthing created by you!! Where is the 25-star button on the website? AW! I love that! Thanks for stopping by! That looks so yummy….it’s 90 degrees today and that would be the perfect dessert….maybe tomorrow! Love your refrigerator by the way! I love how easy this is and anything with strawberries has to be good, right? Thanks, Heather! We LOVE it! Oh Can I have a slice right now! Theres strawberries so that would be fine for breakfast right?! What a great dessert for spring! Nothing better than strawberries and whipped cream; yum! Ok first…SUPER jealous of that refrigerator!!! Second…That ice box cake looks so amazing I’m going to have to make it in this warm weather! Talk about fridge goals!! All I need is some warm weather, a trip to the beach, and a slice of this cake and I’ll be one happy gal! Omg that fridge is awesome! You lucky thing, you! Love icebox cake, nothing beats a classic! Graham crackers and strawberries are such a good combo! I love those flavors together. Your cake looks delicious. Can’t wait to try this! 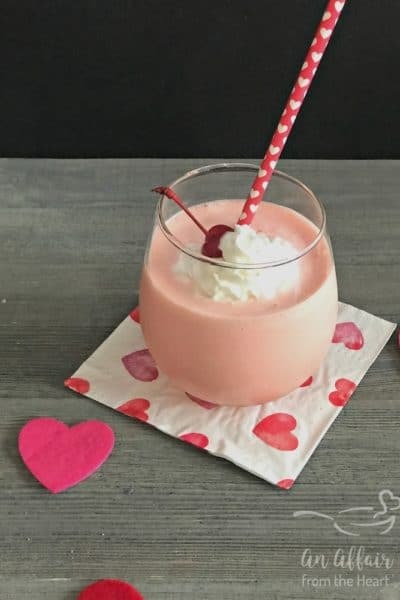 I love strawberry desserts and for me they best represent spring! This looks absolutely scrumptious! 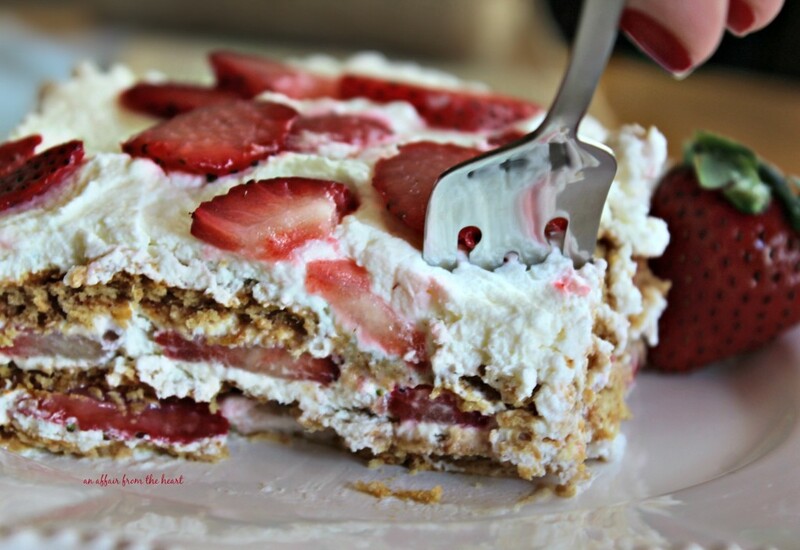 My Grandma used to serve icebox cake and I always loved it, the strawberries look like a delicious addition. As for this recipe – it just makes me smile. I LOVE anything with strawberries, and this is beautiful, fresh and delicious! Perfection is the right word! I can only imagine how delicious this strawberry icebox cake is and how it melts in my mouth the moment I am trying it. 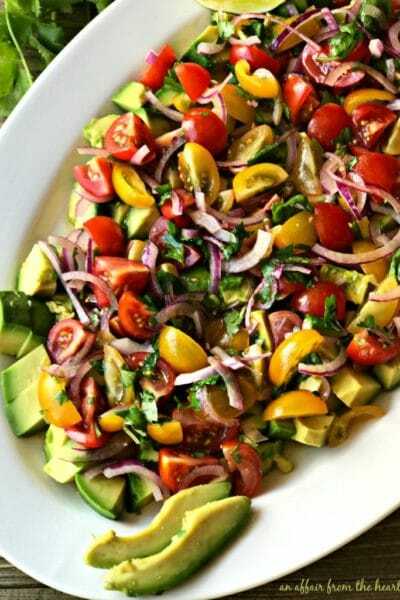 Saving the recipe to my best summer recipes collection! My mother used to make this recipe when I was a kid! I will have to give yours a try; it looks perfect!